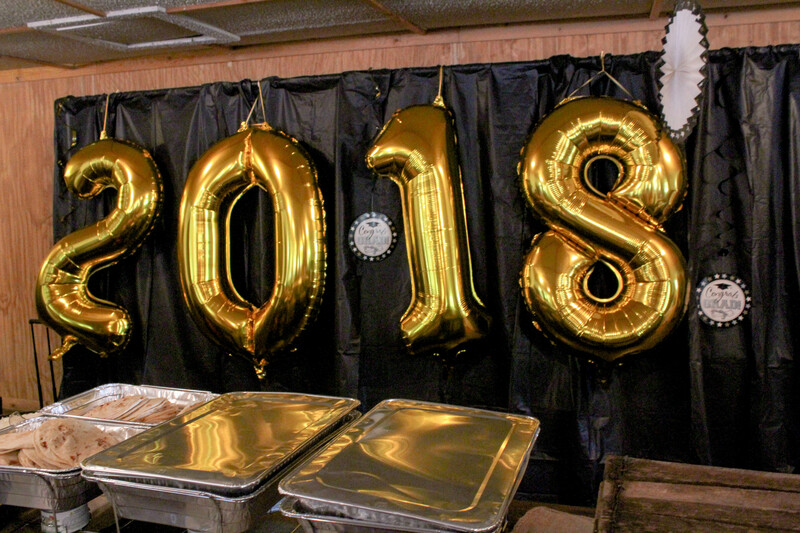 What happens when you have a foodie plan a graduation party? You get all the food bars! 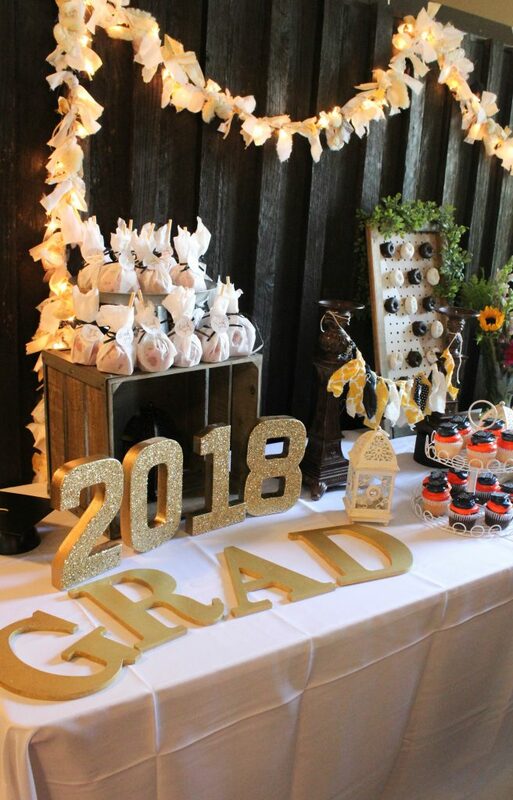 Here are my graduation party ideas to get you started on your next party. 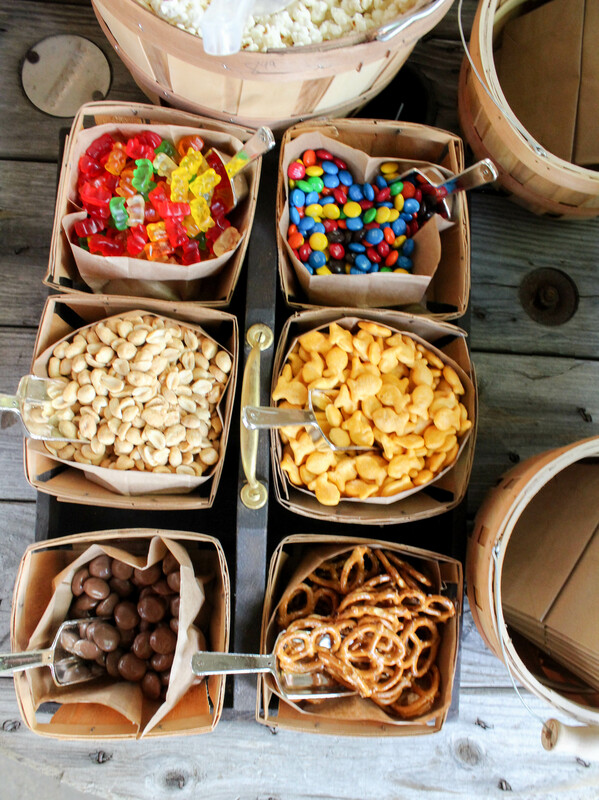 These can be applied to any party! I started planning this party well over eight months ago. 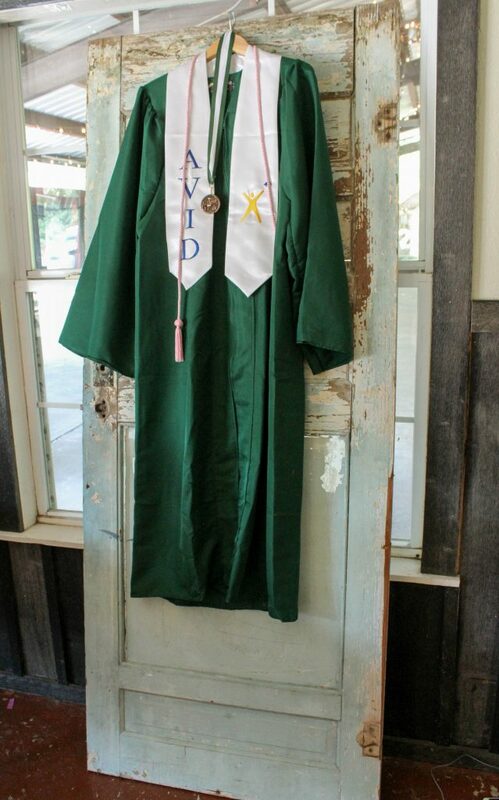 Six months ago my sister asked what we should do for their graduation and I said “I got this!”. Ever since the kids were born I have been in charge of their parties but that ended at about seven when she told me they were done with big parties. 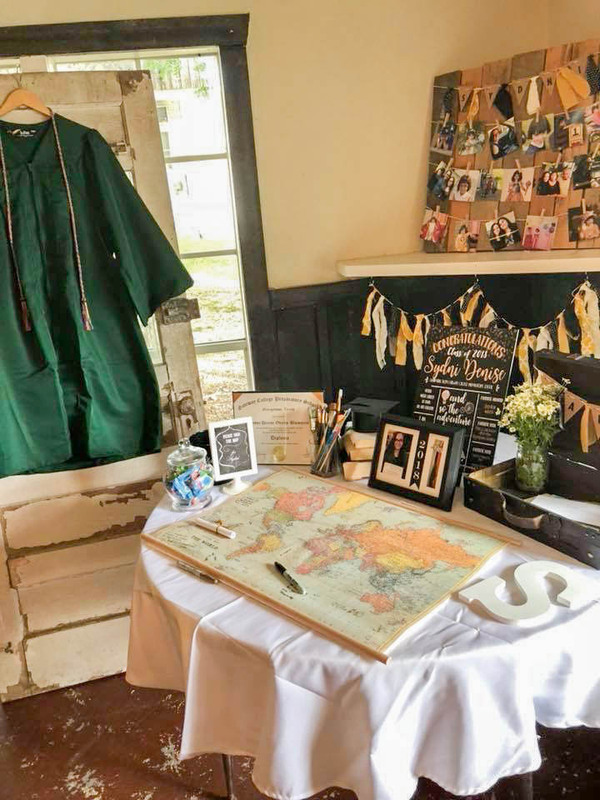 It crushed me because I had so many ideas still to go so I knew I would be planning this one and adding all the ideas I had been pinning to a secret Graduation Party Ideas board for months. My niece and I pretty much planned this one – and by planned I mean I threw out ideas at her and she either said yes or no. My nephew is so easy going that he agreed with everything. The only thing my niece was insistent on was that I did not use their school colors because she hated them – orange and green. So we went with black and gold. 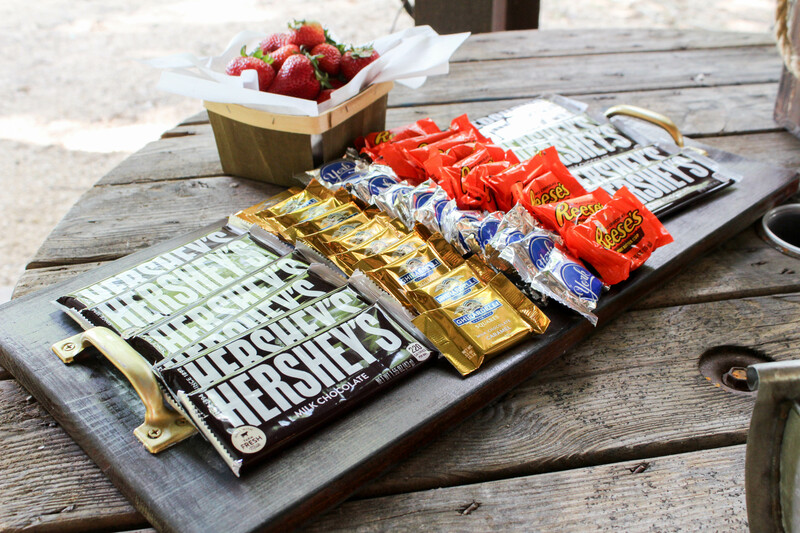 Since we are all foodies in the family, we went with our favorite foods and turned them all into bars. We had a Taco Bar, Waffle Bar, S’mores Bar, Popcorn Bar and Dessert Bar. We had their party at the same location we had their first birthday party. Well, it was on the same grounds, different structure. For that party I went over the top too and had a circus themed party. The kids thought it was cool the party was at the same location. I thought everything turned out great. All my plans did not come to fruition as I wanted, but I was happy with it all. 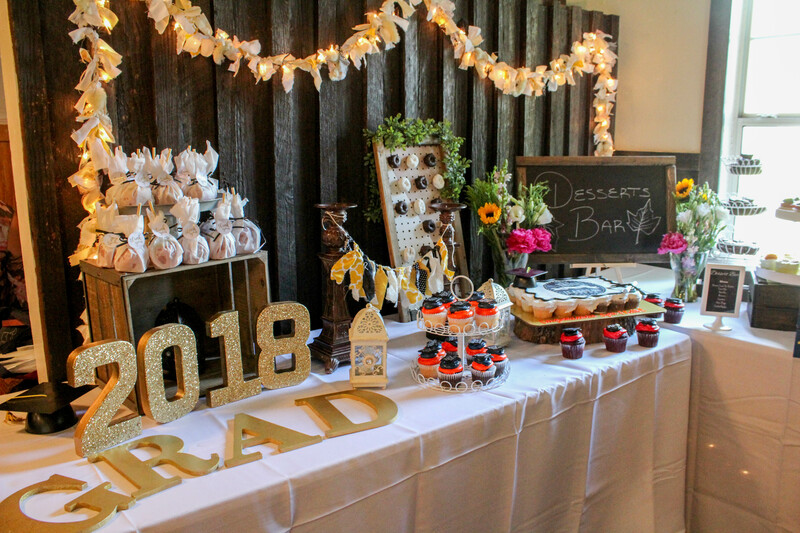 To be honest, I didn’t get nearly any of the photos I wanted because it took so much time decorating everything. My sister Diane, kids and I worked from 8am – 12 pm setting up then my cousins Colleen, Yolanda and Aunt Tina came at 2 to help me finish up. When the first guests arrived at 4pm we were still finishing up and I had rollers in my hair. Ack! 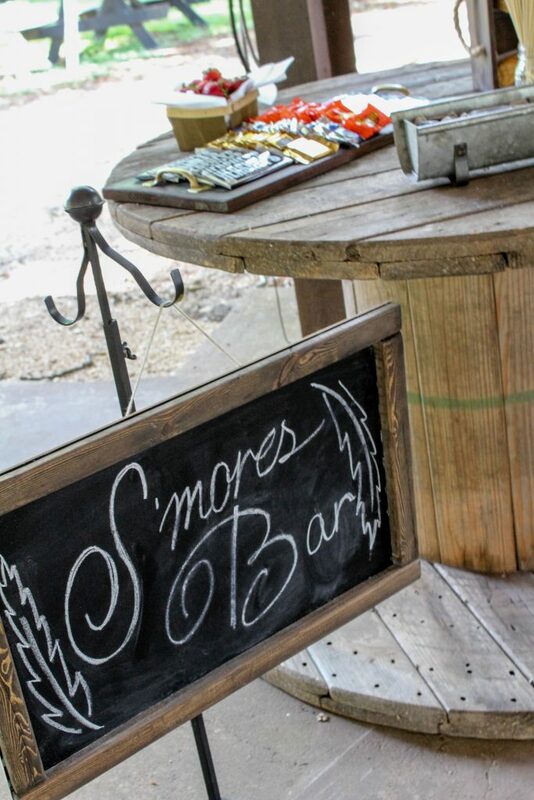 To not make things too crowded inside, we had most of the bars inside and had the S’mores Bar, Popcorn Bar and Photo Booth set up outside. 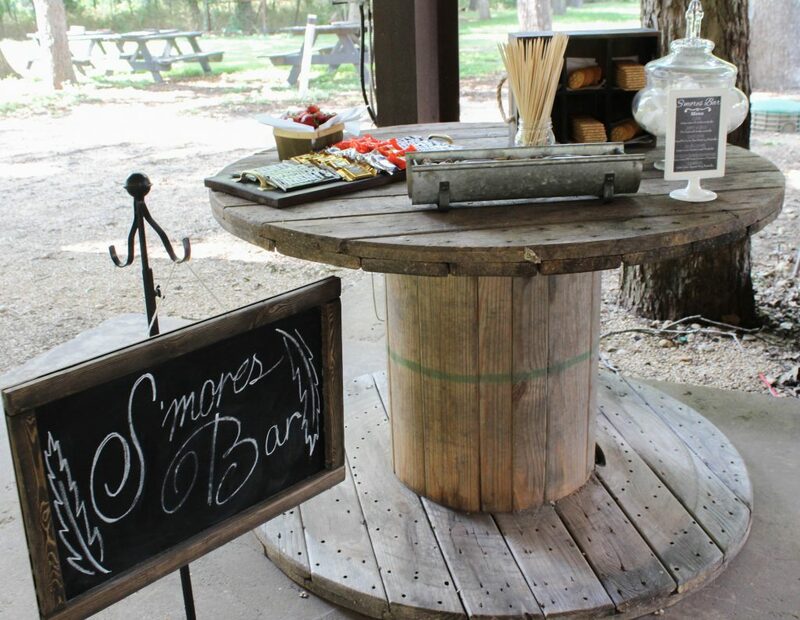 As you will be able to tell from the photos, we had a rustic theme because I am all about wood and burlap. 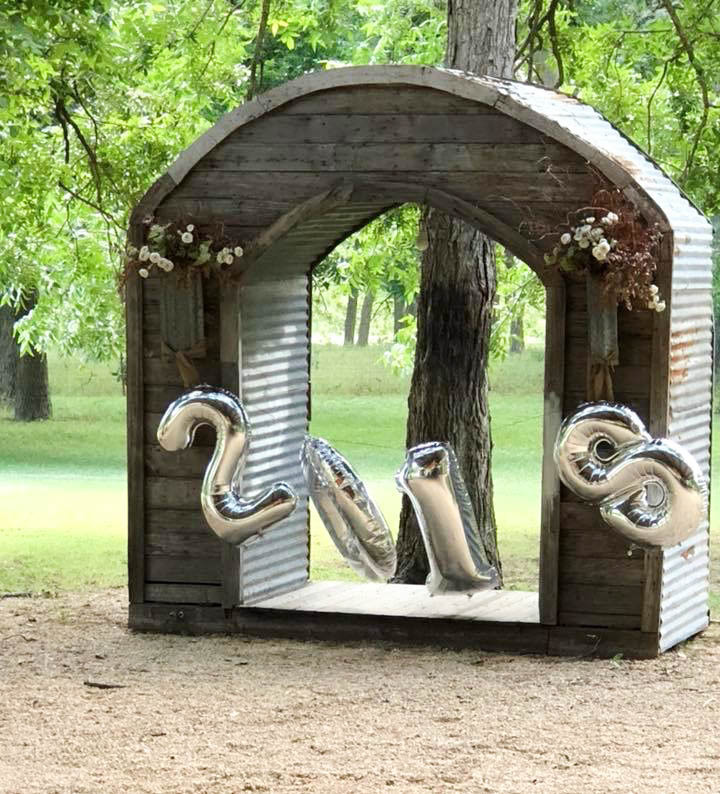 I did a few DIY’s for the party but didn’t take any detailed photos to show you so I will briefly explain at the end what I did. But for now, let’s just get on with the photos! 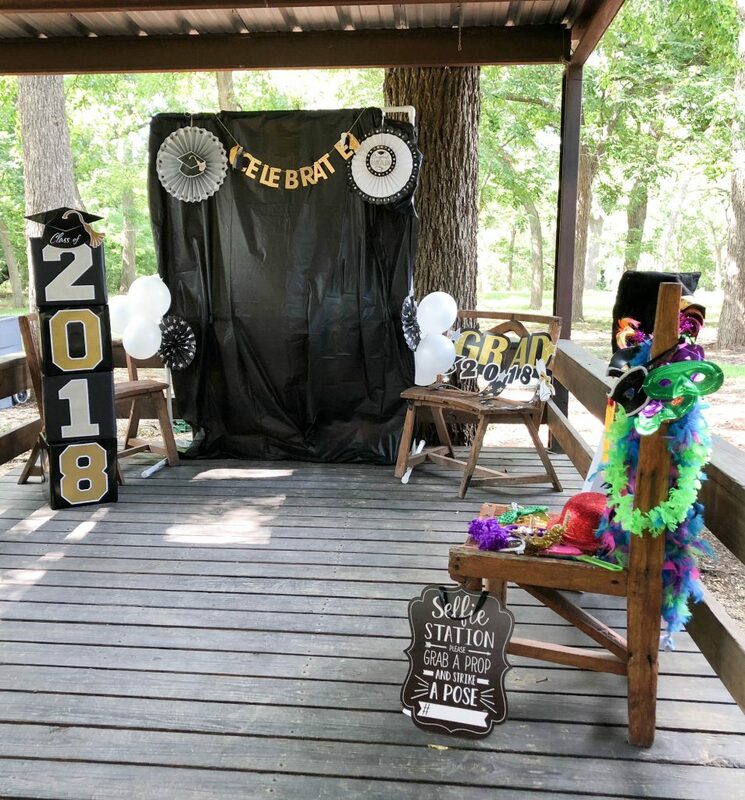 I hope some of these photos inspire your own Graduation Party Ideas. Each of the kids had their own table with their own photos, place for cards, and guest sign-in. 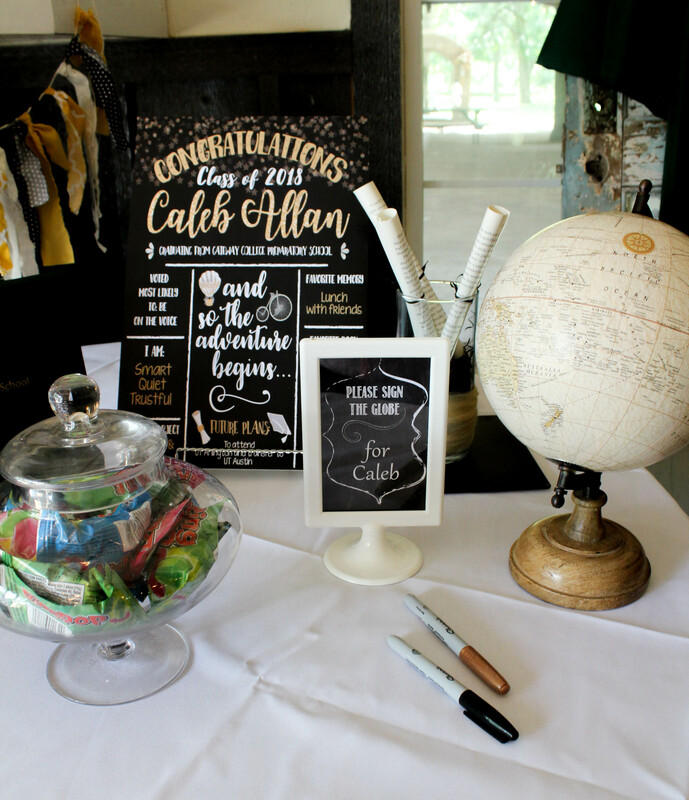 I gave them each options for a guest book and Sydni chose a map and Caleb chose a globe. I wanted quotes on each of them and people to sign around but I was overruled. Choose your battles, right? 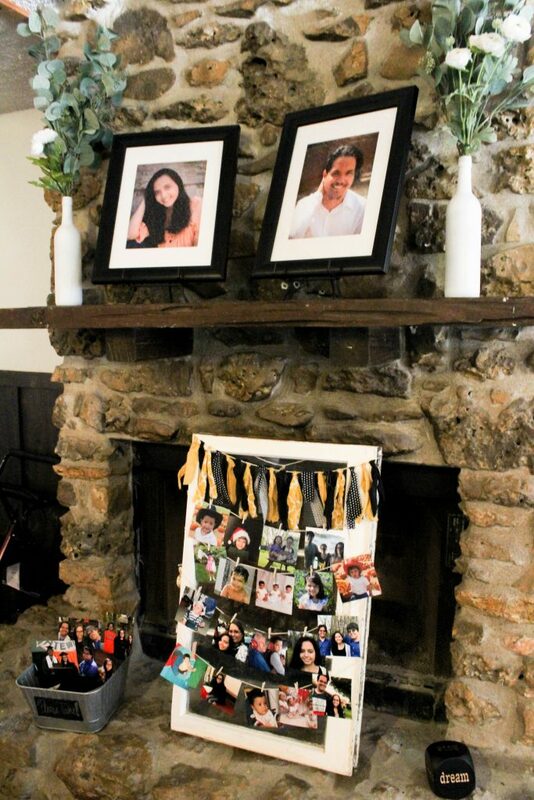 I love the use of pallets and hung photos of each of them in their spots. I also had these signs made from Etsy, printed them up as 11×17 and took them to FedEx Kinkos to mount on foam board. 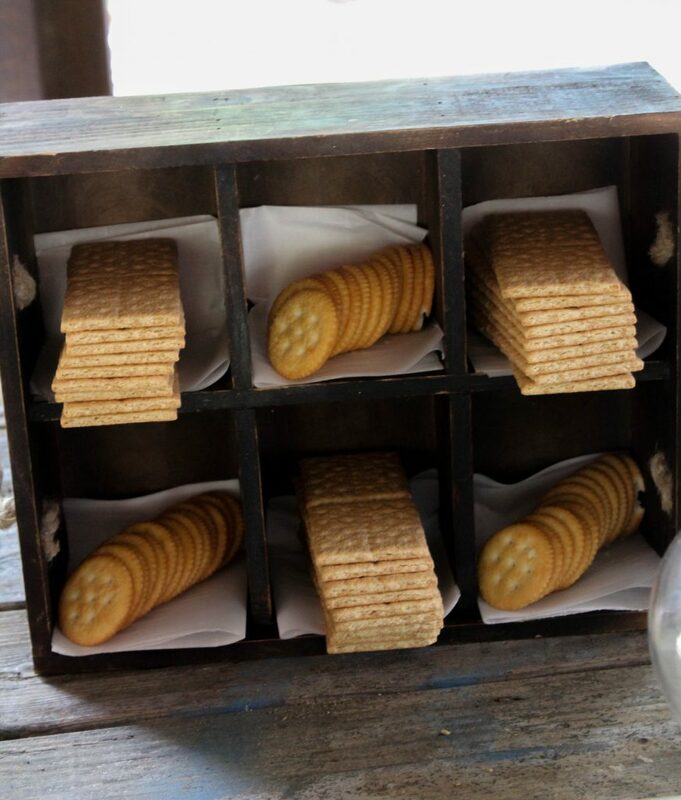 Luckily a friend had an old box that worked for Sydni’s cards. 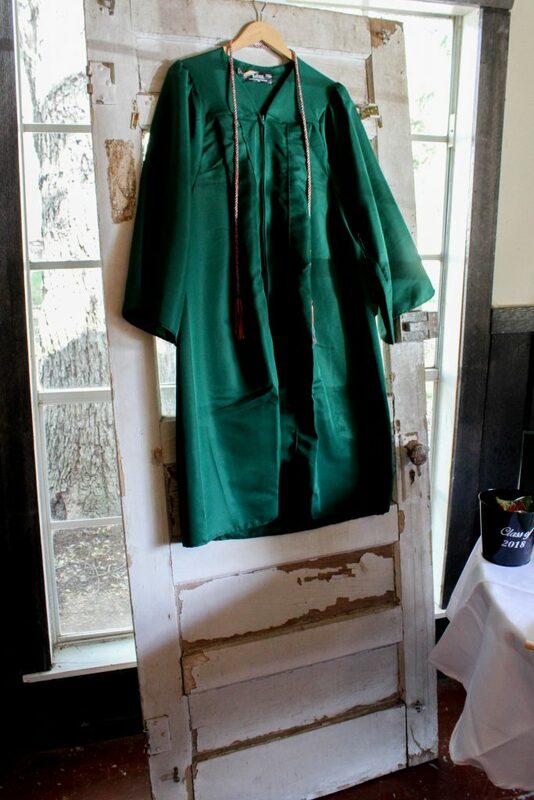 Their robes were hung on old doors provided by the venue. I did not get a great photo of the setup here. We ended up getting the beef and chicken from Rosa’s Restaurant and it was wonderful. I cut up most of the condiments myself. We had queso, chips, and tortillas as well as rice and beans made by my Aunt Rita. Her food is always spot on. One of my regrets is not investing in cloth for the backdrop. It would have helped to make it look nicer – as it was that backdrop was to cover a sink and prep area. 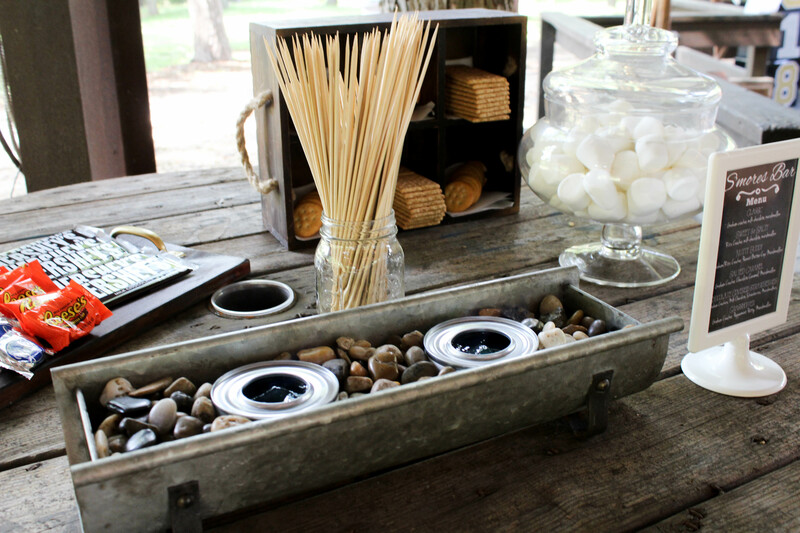 I also nixed the real tablecloths the day of for the rustic look of the bar and regret that looking at the photos. 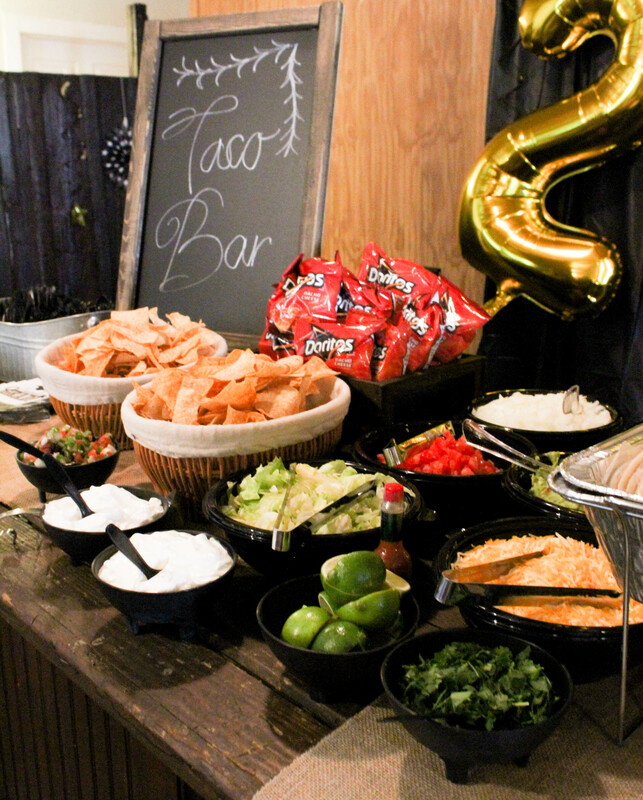 But the Taco Bar was a hit so I really have no complaints. One tip is to not overbuy on the condiments. I had onions and tomatoes coming out all sides. The guacamole and lettuce were the things that went fast. 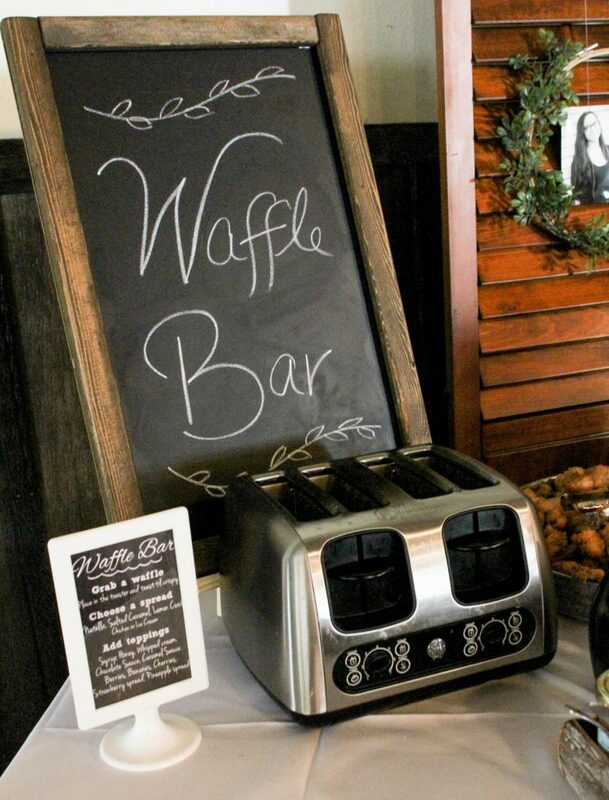 The idea to have a Waffle Bar has been a long time coming. 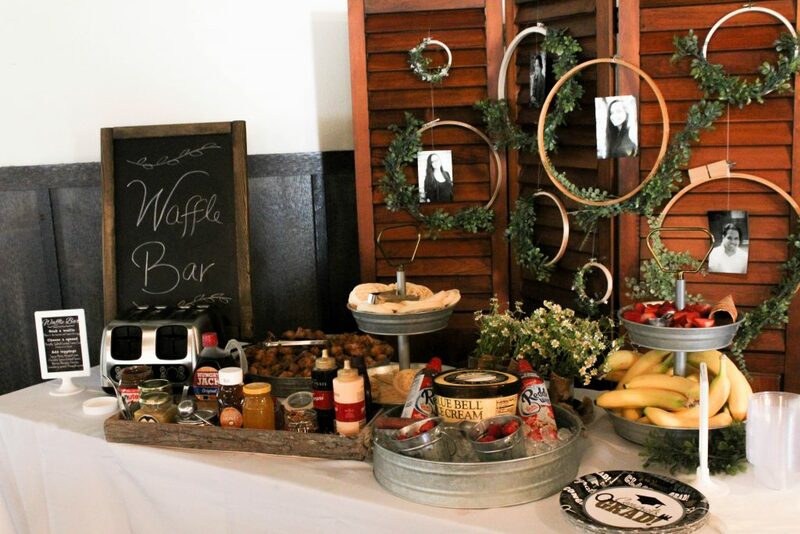 When my niece and I created this waffle bar last year, we both decided then that we would have it at their party. And it was a hit. 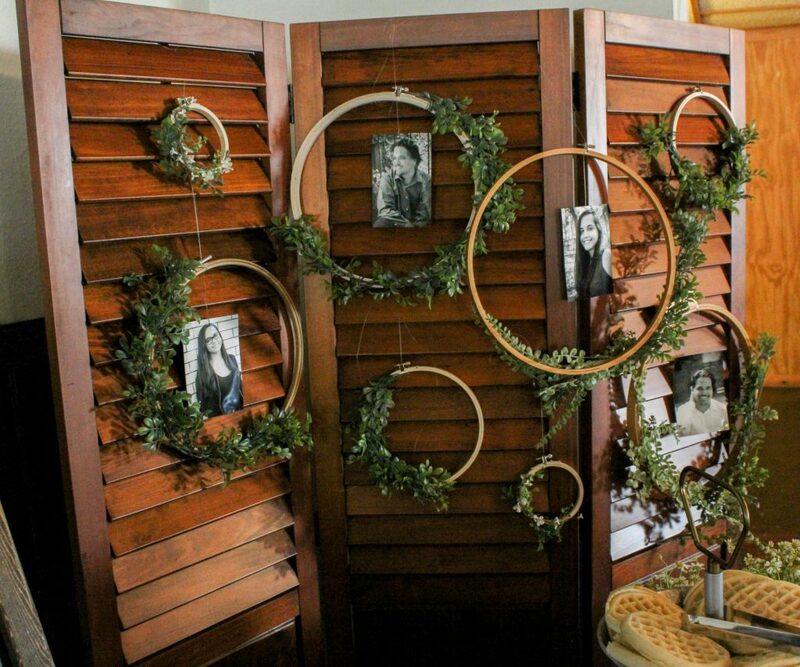 The background is actually my headboard and I loved the hanging hoops from The Cotton Stem so I recreated this look with pics of the kids. I stood around toasting waffles and encouraging people to try different combos of waffles. 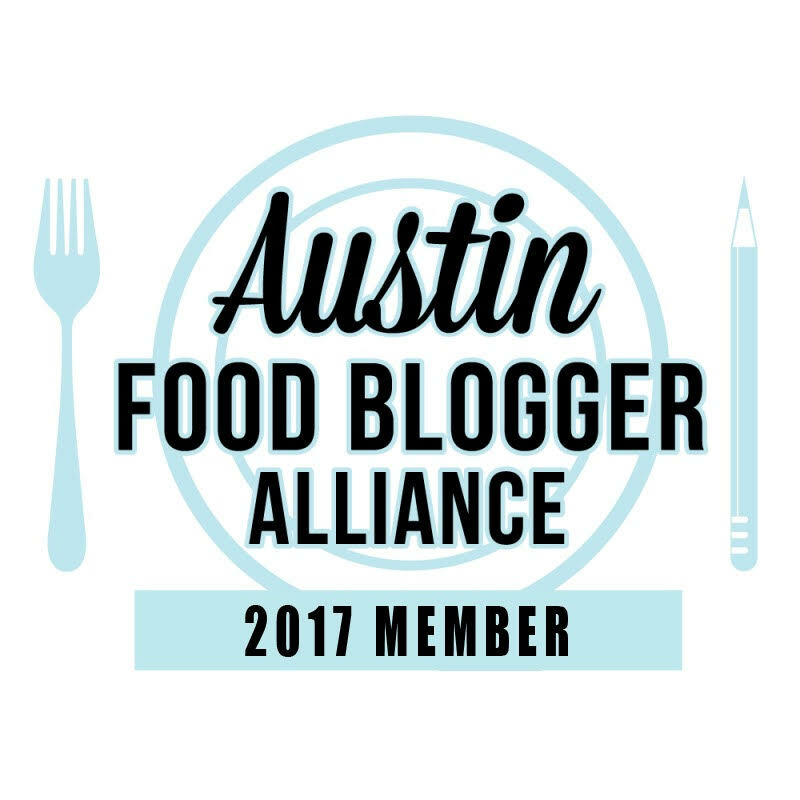 I’m ready for more Chicken and Waffles now! And you can’t see, but I put waffle cones in a small jar and put flowers in them as an added decoration. I don’t even know if this bar needs an introduction because hello popcorn! 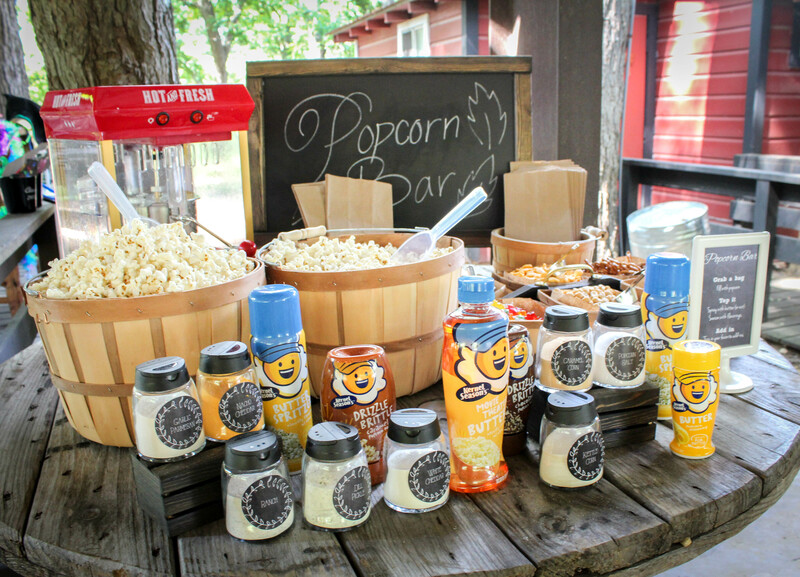 A big THANK YOU to Kernel Seasons who came through with all the popcorn, butter and seasonings for our party. 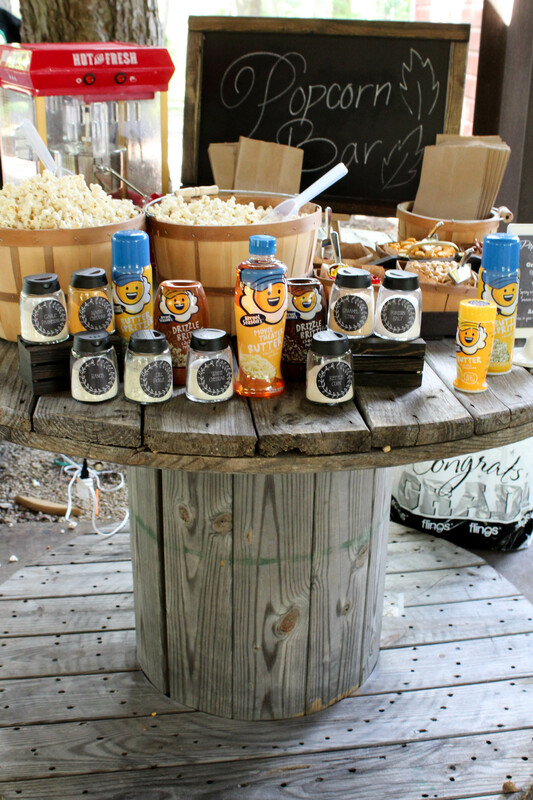 The bar would not have been the same without all these goodies! 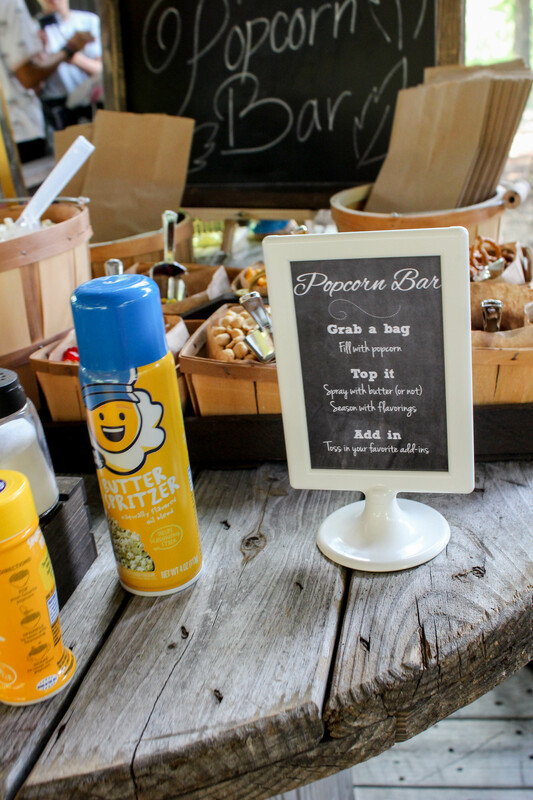 Everyone loved this bar as evidence of us running out of popcorn! I also included six different mix-ins because I love having chocolate with my popcorn. 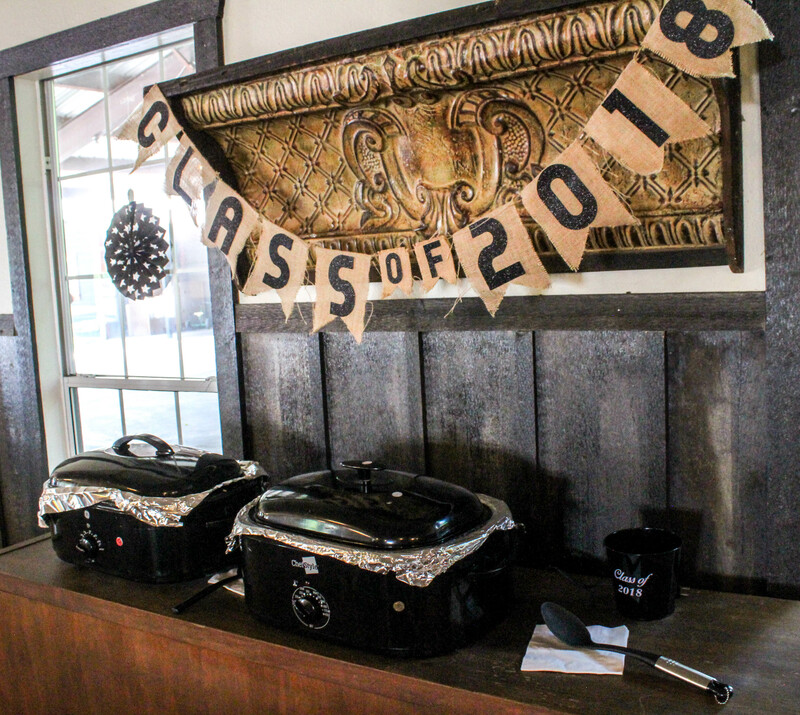 The jars the seasonings come in are cute but I wanted to keep with the rustic theme and tie in the chalkboards too so I created little labels and put them on the shakers. 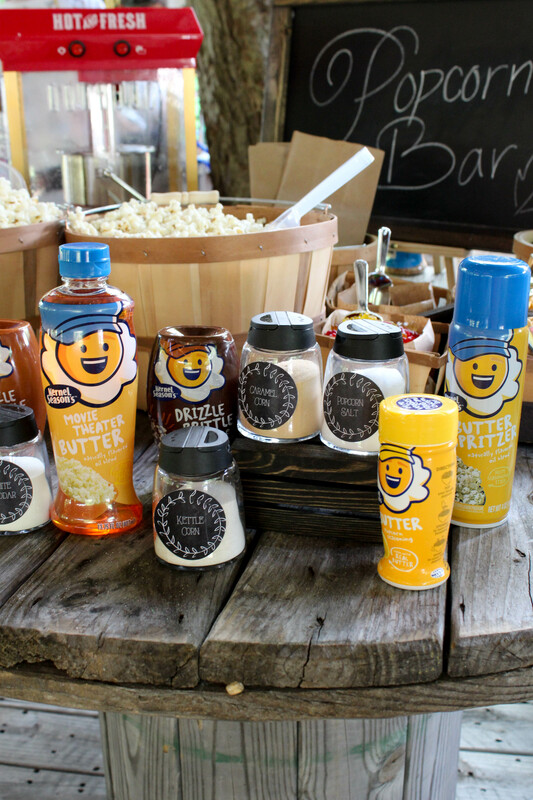 I bought a popcorn maker (similar to this one) for the party and I’m so glad I did. I see us getting a lot of use out of this in the future. 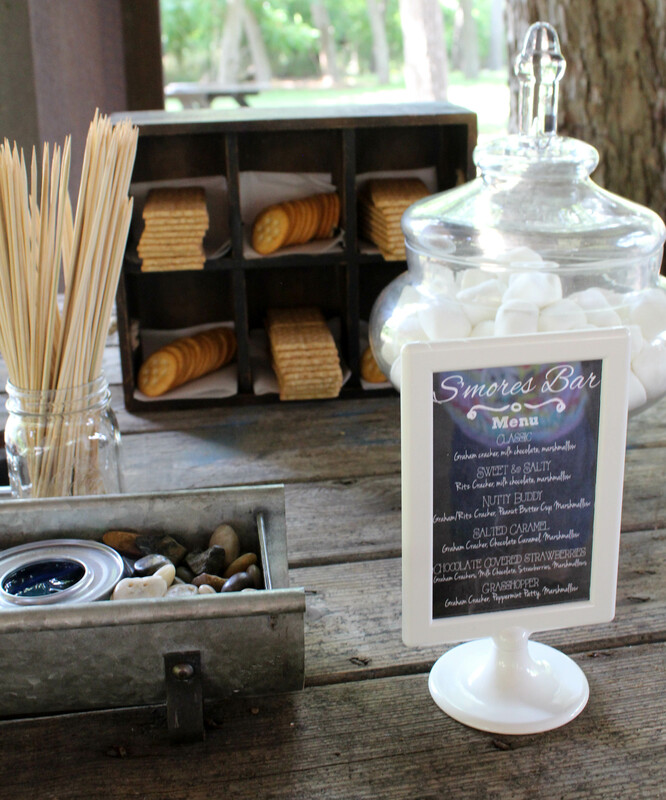 The S’mores Bar is something that was totally for my niece. That girl loves her some s’mores. In hindsight with the party being in the afternoon and in June, I probably should have thought that through and put the bar inside. But I really wanted to use those barrels so I kept it outside. And yes the chocolate melted but it was going to melt anyone so people just squeezed it out of the packaging instead of placing it on there. It all worked out great! 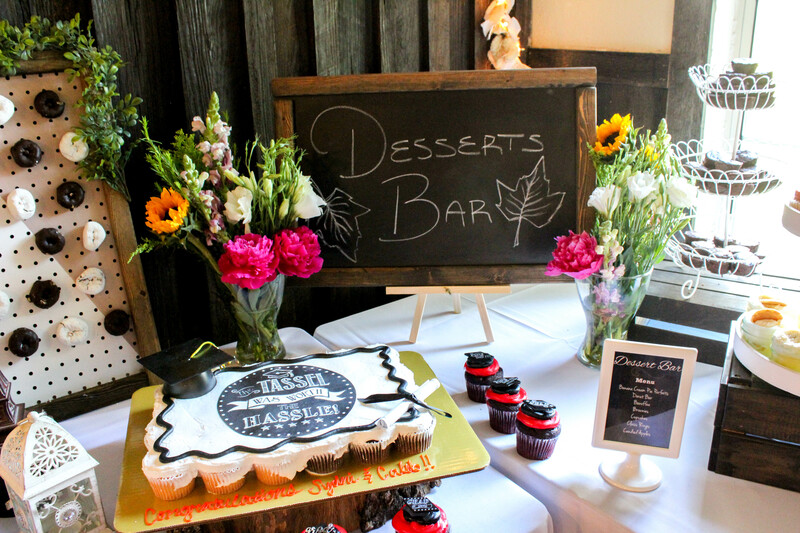 Oh I had plans for this dessert bar. My niece and I painstakingly went through what we wanted out on this bar. My plan was to make Banoffee Tarts (a favorite of my niece), Brownies, Banana Cream Pie Parfaits, and my sister purchased a cupcake cake. The best laid plans. I ordered all my groceries online for pickup and didn’t realize until I had turned the oven on in the one hour between decorating I had to make these desserts that I bought the phyllo dough instead of the tarts. Fail! Then I put the whipped topping on the banana cream parfaits when they were still warm and it melted into an ugly blob. The brownies I made the night before but they were so dang gooey I couldn’t get them to cut into pretty pieces so my cousin came to the rescue and bought some. My favorite was the donut wall though. I just love me some Round Rock donuts! Here’s another regret. I wished I had invested in fabric instead of cheap dollar tablecloths for the background. It was windy outside so we had to prop those chairs on either side to hold down the pvc backdrop holder. That idea came from here on Pinterest. I literally went to Home Depot and showed the gentleman the photo and explained I wanted one exactly like this only a little taller and one double the size. The total cost for it all came in under $30. The boxes were book boxes from UHaul covered in black paper. The 2018 was from a door hanger I bought at Party City and cut apart. Easy peasy. 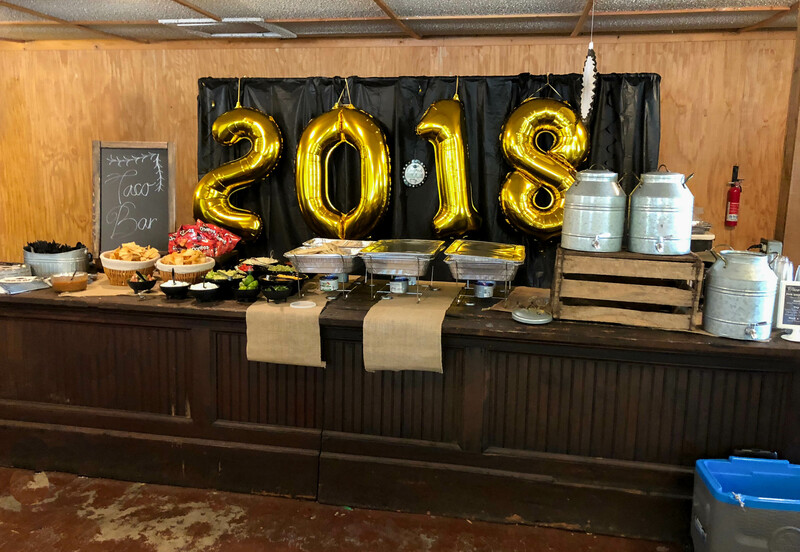 I’ll come back and update this post with the signs I made for each table – they had the menu and different combo options. 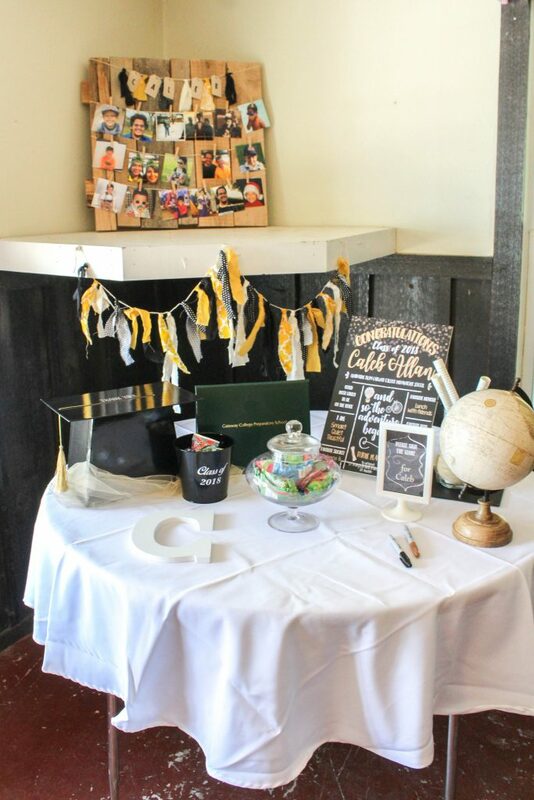 I also need to take photos of the table decorations that I made for each table. Now on the to the DIY. I made the wooden chalkboard signs by going to Home Depot and finding the chalkboard mdf that they had in stock and having them cut it into 3 equal pieces. I then got 1×2 pieces of wood (I think) and had them frame them out. Once home, I sanded them using my little sander I purchased. I love that little thing! Then I stained the wood with Jacobean wood stain and glued the pieces with E6000 glue. I intended to use a pretty font from this Handwriting book but just ran out of time so my niece did it for me. I love how it’s a touch of her. 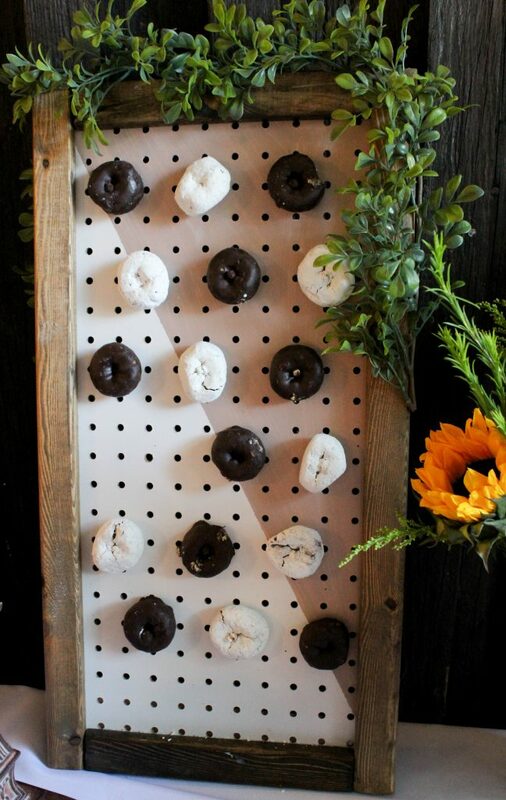 The Donut wall was simple as well. I found the frame at an antique store and took it into home depot and asked them to cut the peg board to size. I painted one side a brownish color then glued it to the frame. 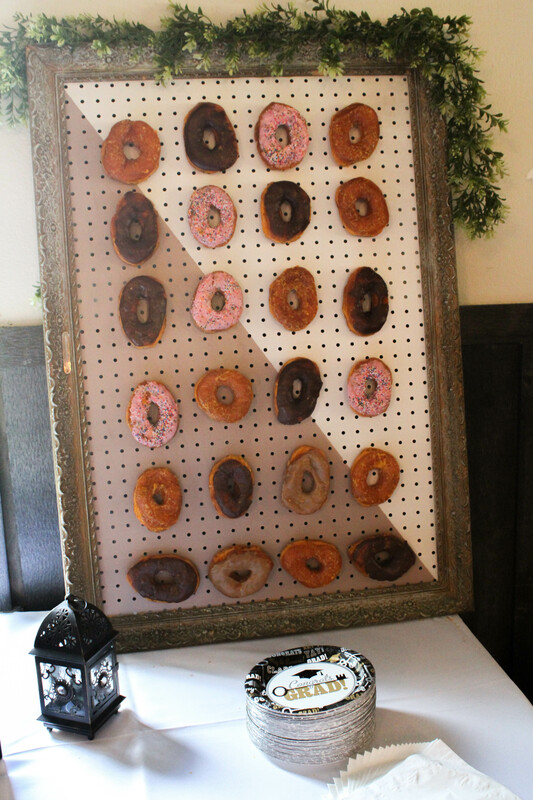 I used these dowel pegs to hold the donuts. I had to loosen the holes a little bit by putting in some scissors and twisting. For the pvc background, we secured the tablecloths with little pieces of Velcro and with double-sided tape on the sides. This was definitely a fun party to plan but a lot of work went into it and the day of. It was all worth it though as my niece and nephew were so happy with it all. 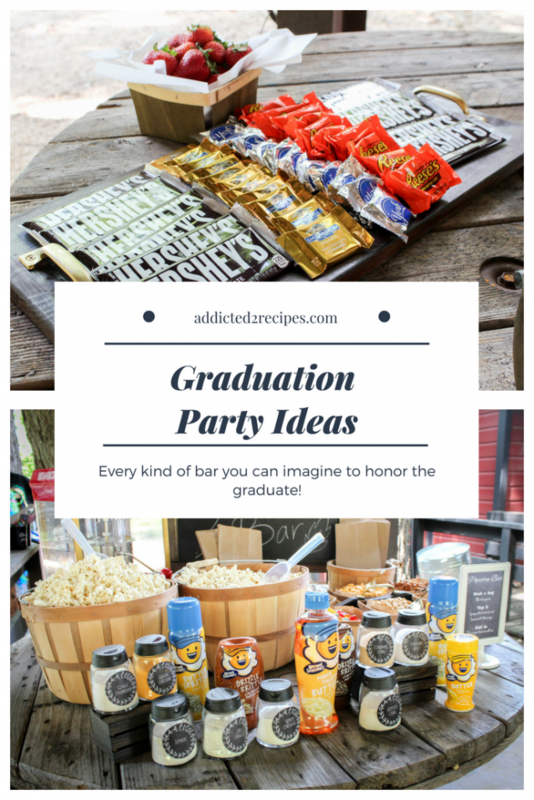 These Graduation Party Ideas can be used for any party really. I’m sure we haven’t seen the last of these bars.